Ricoh GR and Sony RX100 are both compact digital cameras that you can easily carry around in your pocket. However, these two models come with very different features. Ricoh GR offers a larger sensor size that can give you a better crop factor as well as better ISO performance. On the other hand, Sony RX100 comes with a smaller sensor size, but is still an attractive choice due to the built-in stabilization and high continuous shooting speed. Continue reading below for the more detailed comparisons between Ricoh GR vs Sony RX100! 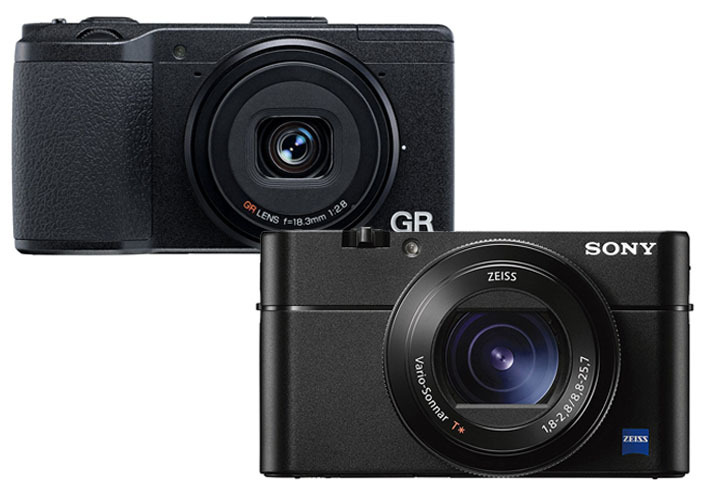 If we compare the dimensions of Ricoh GR and Sony RX100, the Sony camera may be more attractive at first. It comes with a smaller and lighter body. It measures 102 mm x 58 mm x 36 mm, and the weight is about 240 grams. It is indeed very easy to carry around. However, the smooth, compact design makes the handling a little tricky. It does not have a real grip area, and it may become slippery in a sweaty hand. Nevertheless, the construction is quite solid and durable. See also: Sony RX100 vs RX100 II! Ricoh GR is slightly bigger and heavier. This model measures 117 mm x 63 mm x 35 mm and weighs 251 grams. However, it has a textured grip area on the right side, which improves the handling. It is easier and more comfortable to hold, allowing you to be confident to take a shot. The big difference between Ricoh GR vs Sony RX100 is the image sensor. Ricoh GR comes with a 16 MP APS-C sensor. The resolution is lower, but this is not a problem unless you need to produce large-sized images. The camera delivers decent sharpness and detail, and the larger sensor allows a better crop factor and brightness. The ISO performance is better. The higher ISO levels are quite usable. On the other hand, Sony RX100 comes with a 20 MP one-inch sensor. The original model uses a regular sensor, but the later versions already have backside illumination. The backside illumination helps to improve the brightness and ISO performance, but the higher ISO levels are still plagued with noise. Ricoh GR is great for most purposes, but not really great when you need a powerful AF system and high continuous shooting speed for shooting a moving object. Well, the AF is pretty good with 9 focus points, but not as good as Sony RX100’s. The continuous shooting speed is only 4 fps. Nevertheless, the ISO range goes from 100 – 25,600 and the maximum shutter speed is 1/4,000s. These features will make it quite powerful and versatile. In addition, it has built-in Wi-Fi, an optical viewfinder, an external hot shoe, and a built-in ND filter. On the other hand, Sony RX100 is equipped with built-in stabilization which is very handy in many situations. This camera is pretty good for shooting moving objects, as it has a powerful AF system with 25 focus points and 10 fps continuous shooting. In addition, it has 3.6x optical zoom. - 16 megapixel APS-C CMOS image sensor offers low-noise characteristics, super-high resolution with no compromise in image quality or color accuracy. - The advanced GR ENGINE V imaging engine offers high-sensitivity shooting with minimal noise and the GR's anti-aliasing filter less design produces supremely high resolution, color-rich images. - The GR's fixed wide angle 18.3mm F2.8 GR lens, equivalent to 28mm in the 35mm format, provides high resolution images with edge-to-edge sharpness. With its nine blade diaphragm, the GR lens produces a natural Bokeh effect at larger apertures. - Despite its large image sensor, the GR has a compact and portable design. Its casing is made of a lightweight magnesium alloy, while its exterior design retains the style typical of the GR series. In general, Ricoh GR is more recommended. It has a better image sensor and better overall features. The design also allows better handling. However, you can choose Sony RX100 if you really need the stabilization, powerful AF system, and high continuous shooting speed.